In the midst of matches, we often struggle to obtain the perfect item to dominate as Vainglory carries. 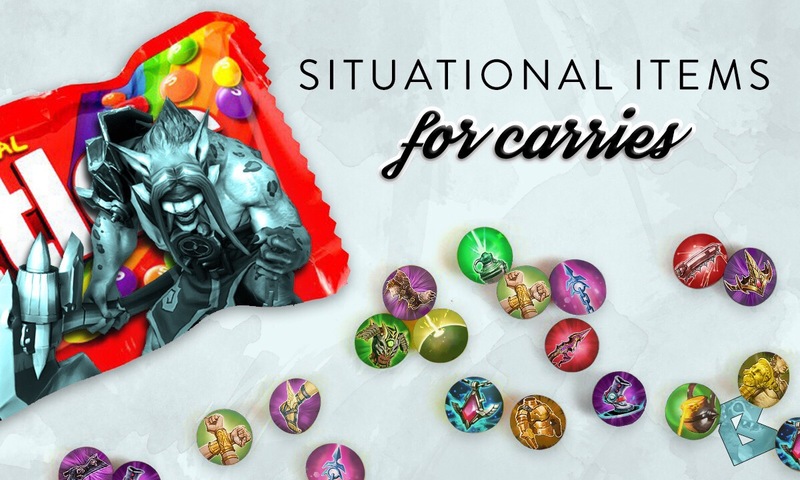 Broken Myth’s Situational Items series offers in-depth analysis of items to choose from in order to complete your build. 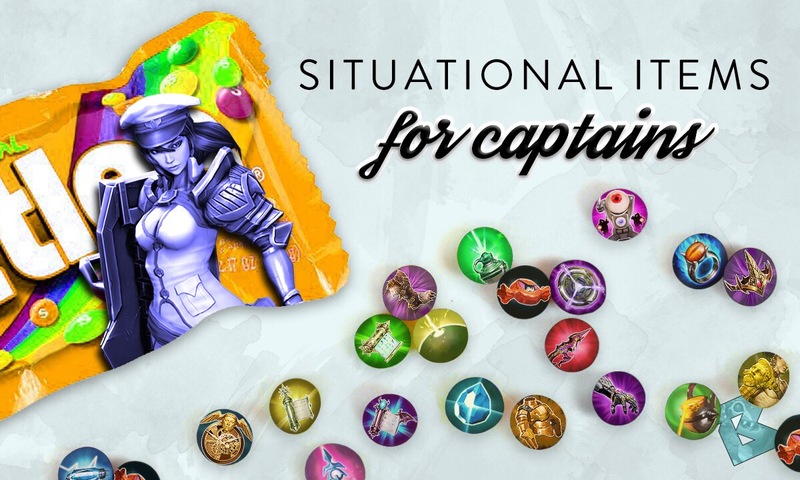 Be sure to catch our follow-up guide coming soon: Situational Items for Captains. These two resources augment our new Top Hero Builds page releasing tomorrow. Without further ado, let’s dig in! Aegis – Offering a combination of shield and Reflex Block, Aegis serves as a go-to item for defense. Aegis is the most common defensive item on ranged carries such as Baron, Celeste, Ringo, SAW, Skaarf, Skye and Vox. As more and more crowd control is introduced to Vainglory, the necessity for Reflex Block is crucial for survival. With a crystal path carry almost always present on the enemy team, Aegis tackles both of these problems at once. On ranged carries, Aegis is commonly built as the third T3 item. Occasionally, melee bruisers such as Grumpjaw, Krul and Rona may opt for Fountain of Renewal over Aegis as a defensive shield item for the team-wide heal. Against enemy teams with abundant crystal power, purchasing both items may be considered on corresponding heroes. Atlas Pauldron – Atlas Pauldron is the ideal defensive item against weapon power. It’s commonly bought by melee bruiser heroes such as Blackfeather, Glaive, Grumpjaw, Kensei, Krul and Rona, and Tony. By heavily reducing enemy attack speed, Atlas Pauldron counters heroes that are reliant on quick basic attacks to deal damage. 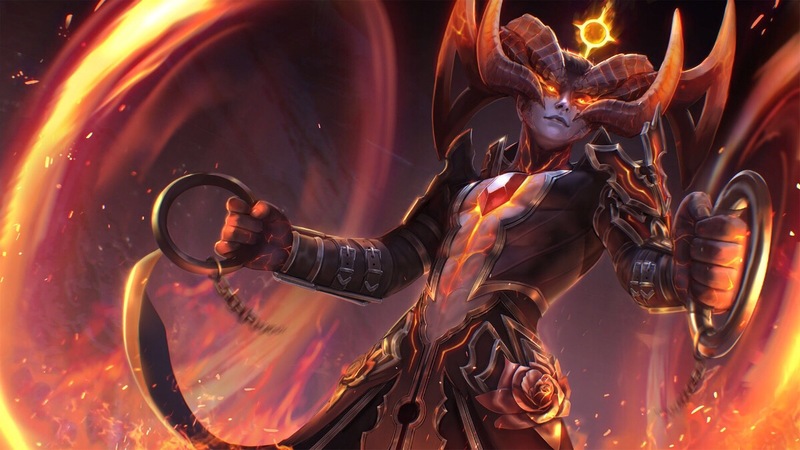 This list primarily entails Baron, Gwen, Kestrel, Ringo and SAW, but it is not uncommon to see that hero pool expanded beyond typical weapon carries to high damage output crystal carries such as Adagio, Idris, and Vox. Usually, Atlas Pauldron is built as a third T3 item or later. On ranged carries, this item isn’t as often built — your captain or melee ally should build an Atlas Pauldron. However, against sticky heroes, it can be beneficial to build Atlas Pauldron as the third T3 item or later. Crucible – Although Crucible adds a chunk of bonus health, it’s not typically built on carries. The shield and armor from specialized defensive items such as Aegis and Metal Jacket is much more effective in team fights. Crucible is most commonly built if a crystal path carry is not present on the enemy team and a Reflex Block is required. In these very rare instances, it’s often best to prioritize armor first. This makes Crucible commonly built as a fourth T3 item or later when appropriate. Fountain of Renewal – Fountain of Renewal is certain to be acquired by captains, but is not often seen on carries. Some melee bruiser heroes that do not require numerous damage items, such as Alpha, Grumpjaw, Krul, Ozo and Tony, may build Fountain of Renewal for extra sustain. The team-wide heal is perfect for protecting the lane carry. Squishy carries will typically not build a Fountain of Renewal. In 5V5 matches where the enemy is running a triple crystal power composition (double in 3V3), you may find it advantageous to build both Aegis and Fountain of Renewal. When it’s applicable, Fountain of Renewal is usually built as the fourth T3 item or later. Metal Jacket – As Aegis’ armor-based counterpart, Metal Jacket contains a high volume of armor. Unlike Aegis, however, Metal Jacket lacks a Reflex Block, so carries building this item usually dedicate two item slots for defensive items. Ranged carries can often avoid building armor with skilled positioning. However, if you are consistently pinned down by a weapon carry, immediately build Metal Jacket! Melee carries will often build Atlas Pauldron instead of Metal Jacket for the added team utility. In 5V5 matches against triple weapon power compositions (double in 3V3), bruisers such as Alpha, Blackfeather, Kensei, Krul, Rona, Ozo and Tony may build both Atlas Pauldron and Metal Jacket. Reflex Block – Reflex Block is a core defensive item on all heroes. For little gold, you receive bonus health and arguably the best active effect. On activation, Reflex Block provides a health barrier and blocks all incoming crowd control effects (stuns, slows, silences, etc.) for a short time. With precision, advanced players are also able to block Atlas Pauldron and Nullwave Gauntlet. When playing against squishy carries or enemy heroes with detrimental crowd control effects, you should build Reflex Block by level 8. Slumbering Husk – Slumbering Husk is the ultimate counter to heavy burst damage. In addition to providing a high bonus health amount, Slumbering Husk fortifies your remaining health following burst damage. Since almost all burst damage is crystal, Slumbering Husk is usually built in addition to Aegis and unassociated with Atlas Pauldron or Metal Jacket. For this reason, Slumbering Husk is primarily built on squishy, immobile carries such as Adagio, Celeste, SAW and Skaarf. Slumbering Husk is usually built as the fourth T3 item or later. Bonesaw – Bonesaw’s passive effect, combined with its armor-shredding ability, is an innate choice against heavily-armored enemies. Usually built as a third T3 item or later, Bonesaw is most effective against enemies who have built Metal Jacket or multiple armor items. Although sometimes seen on Alpha, Baron, Blackfeather, Ringo and SAW, a Bonesaw may take the cake on other weapon carries when built to counter high amounts of armor. Poisoned Shiv – Poisoned Shiv minimizes target healing, fortified health, and barrier while providing sufficient lifesteal. It’s most common against heroes relying on these resources such as Krul, Reim and Ozo, as well as sustain-based melee bruisers such as Baptiste, Blackfeather and Rona. Poisoned Shiv may also be worth investing into if enemy crystal carries have opted for Eve of Harvest, which provides lifesteal. Weapon carries should keep a close watch on the enemy’s item choices to decide whether or not to invest into Poisoned Shiv. If so, it’s usually built as the second T3 item or later. Shiversteel – Shiversteel is a first-rate item for melee bruisers to stick onto their targets. Typically most purchased on Blackfeather and Rona, Shiversteel is sometimes seen on other heroes such as Alpha, Kensei and Krul because of the additional attack speed bonus. Since its slow duration is significantly lower for ranged heroes, Shiversteel is almost never built on ranged carries. When warranted, Shiversteel is usually built as the second T3 item or later. Spellfire — Spellfire counters sustain-based heroes and items by applying mortal wounds to targets damaged by an ability, reducing their healing, fortified health, and barrier by 33%. In addition, Spellfire’s damage over time effect makes poke damage more effective for heroes with crystal damage abilities on low cooldowns, such as Celeste, Kestrel, Samuel, and Skaarf. Abilities with area of effect damage are particularly menacing coupled with Spellfire to apply mortal wounds across multiple enemies at once. Spellfire is usually built as the first T3 item or later, so decide early on what you’re prioritizing. Stormcrown – Stormcrown provides consistent damage against creeps and objectives. Although Stormcrown adds some damage against heroes, it’s not used as a damage-intent item. On carries, Stormcrown’s primary function is to assist in surviving the early laning phase while offering moderate ability cooldowns. Cooldown-based dive heroes, such as Glaive, Taka and Grumpjaw, usually accompany Stormcrown with Aftershock. Stormcrown should be built as the first or second T3 item. Ranged carries should generally avoid building Stormcrown; pure damage items are more beneficial! Halcyon Chargers — Halcyon Chargers offer a longer-lasting sprint effect but are on a significantly longer cooldown compared to Journey Boots. However, their primary calling is the passive stats they provide: ability cooldown reduction and energy regeneration. As such, Halcyon Chargers are commonly built on crystal carries who struggle with energy management, benefit from cooldown reduction, or lack mobility in their kit. Journey Boots — Journey Boots are the most prevalent footwear option on Vainglory carries. In addition to their morsel of defense, they provide the ability to sprint every few seconds after attacking an enemy hero. Journey Boots are used as a frequent gap-closer on melee heroes and as a quick escape from sticky melee heroes on squishy ranged heroes. If you can’t decide which shoes to purchase, Journey Boots are the best investment. Teleport Boots — An item that’s unique to Vainglory 5V5, Teleport Boots stray away from other options. Instead of a sprint effect, Teleport Boots magically teleport you to an allied turret, Scout Cam, or minion with a brief burst of speed afterward. They are most commonly bought as a team-wide decision in the late game to enter the enemy’s base and finish the game sneakily. War Treads — Because of their low base movement modifier, War Treads are the least common boots option on Vainglory carries. They provide a substantial amount of bonus health, making them a possibility for heroes whose kit synergizes with health, such as Ardan, Lorelai, Lyra, and Tony. War Treads’ active effect provides a sprint to all nearby allies, which is incredibly important for engaging and disengaging a fight. They also may be considered in team compositions that must dive the enemy.